Kawakwakwakwakwaaaaa...this guy actually broke the table into pieces, used it as fire wood and made pepper stew to feed them all. Chaiiii. This is so funny. If AY begs too, that means I need to steal that his book oh. Ah! Lol.. I no fit laugh again to. Pretty Mike bad. Imagine Ushebebe almost drowned for pool to "show how serious he is for the begging format". I just de imagine the scenario. Haaaaaaaaaaaaaa nawa oooh AY begger?? Where is Duke of spades list? That is the one I'm interested in seeing. 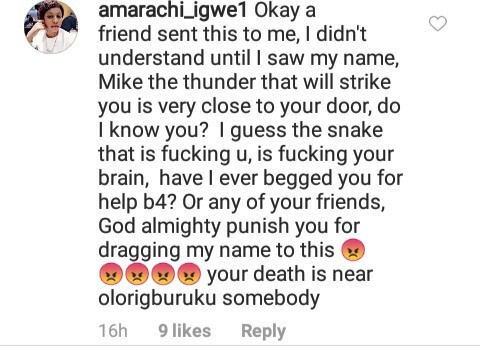 Oga used the threat to get his money from them debtors. I doubt there'll be a list from him. Lmao... this pretyy mike guy is something else. What is this abeg? 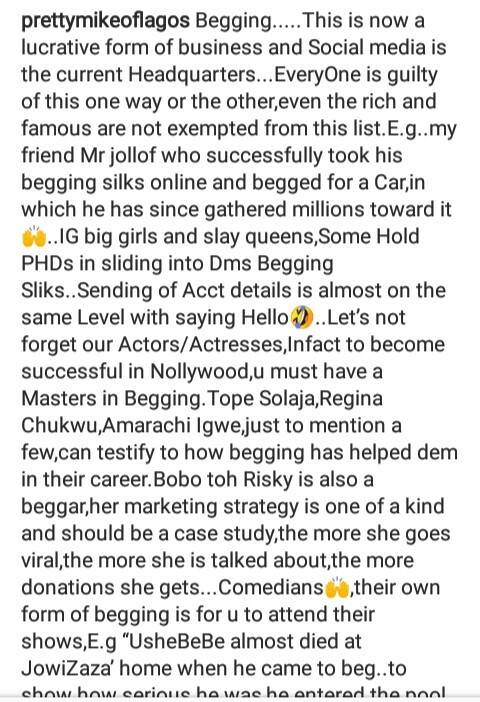 But then, its same "celebs" that also find love in calling out "beggars"
mike with his bleached skin looking like coat of many colors...some pple are senseless....she jst threatened him,should anything happen to him,she is d first suspect..
Mike mike always trying to be relevant. Everything has failed now he’s resorting to this. U and gifty are In The same category. Irrelevant and trying to be relevant. Lmao this guy has started again. 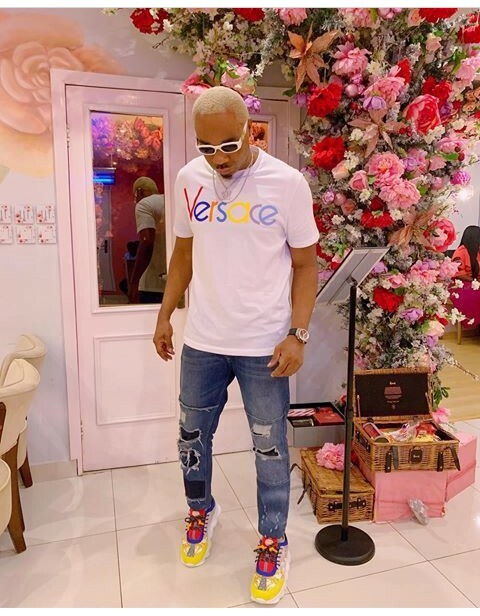 Pretty Mike is Mouthetted Hahahahaha Na waooo ooooo..
Abeg if you no get money beg o make person way get help/dash you. Don't allow shame to drag you to do what you will make you hate yourself. It has worked for AY and this is why he’s willing to follow Amaju Pinnick to the end of the world. The beggy beggy has paid them well. Name the area boys now😂😂😂Let them send you e slap. All these yeyebrity beg a lot during election. Campaign for criminals and stupid people. After election you will see them on IG and other social media platform lamenting like a mad dog. Let me go anon on this one.This Jowizaza guy was my coursemate in school. The guy is balling but i no send am. 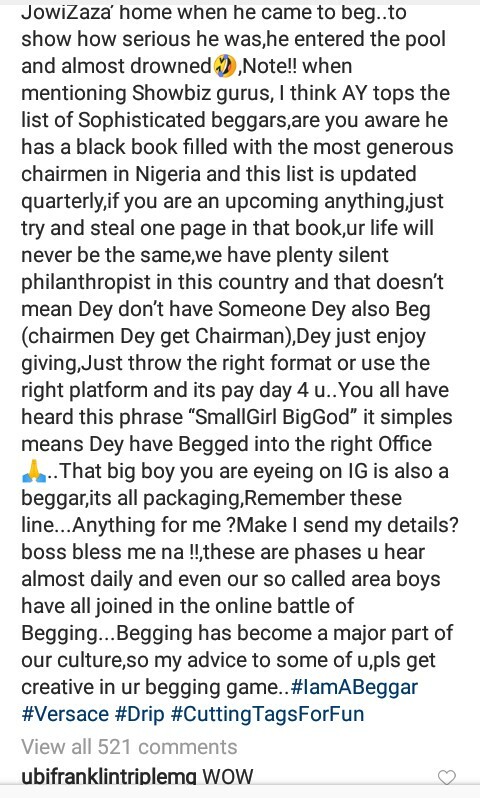 Biko there's no harm in begging small na.